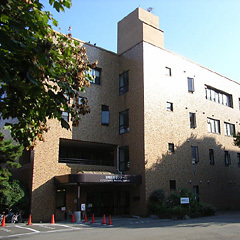 The Veterinary Medical Center (VMC: the former name was Veterinary Hospital) was established in 1880 and engages in education and researches on clinical veterinary medicine. VMC is a 4-story and 3,000 m2 buildingand is equipped with advanced diagnostic imaging systems, such as color Doppler ultrasonography, endoscopy/arthroscopy, CT and MRI. Approximately 15,000 animal patients are referred to VMC every year to receive the advanced and high-level clinical services. VMC plays an important role in educating undergraduate students. They receive various clinical practices by the academic staffs of VMC and bedside education through the clinical rotation. In addition, researches of graduate students belonged to clinical laboratories utilize the various information on the diseases depending on their fields. The researches currently conducted in VMC are neoplastic diseases, various immune-mediated diseases, neurological diseases, hereditary diseases, anesthesia/analgesia, and orthopedic diseases. Recently collaborated researches with medical school/medical hospital, companies and/or other institutions are conducted, which may lead to producing novel techniques and drugs useful for both human and veterinary medicine. This translational research should be one of the important role of VMC. Furthermore, VMC receives 10-15 fresh veterinarians for their clinical training every year. They work as residents/hospital staffs in the clinical services of VMC and obtain the higher knowledge and techniques in small animal practices. These activities of VMC must satisfy the social demands for maintenance and improvement of human welfare, and to fulfill the requirement for education and researches in veterinary medicine. Students and residents are watching the surgery. A resident and a veterinary technician are treating the patient. Magnetic resonance imaging is used mainly for diagnosis of neurological diseases.